Handle signs and sheet material with the adjustable bucket forks. 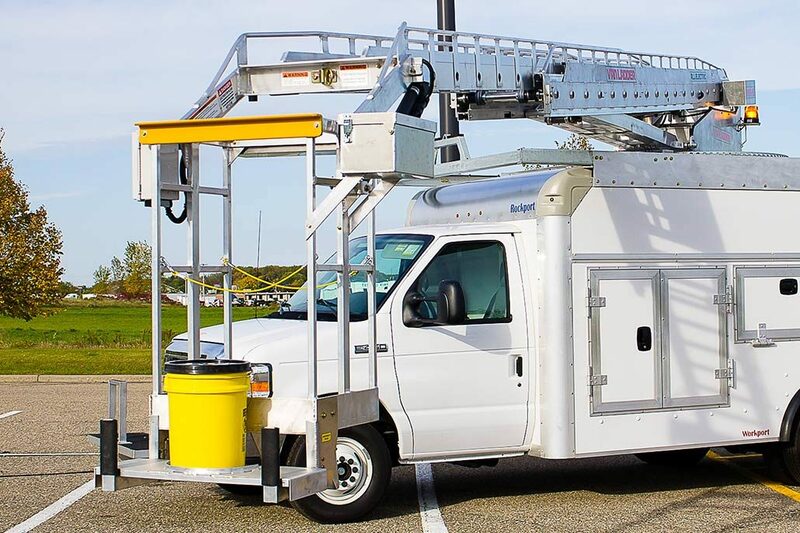 The Van Ladder quickly converts to a mini material handler with this optional accessory. Make putting up raceway signs a one man job. 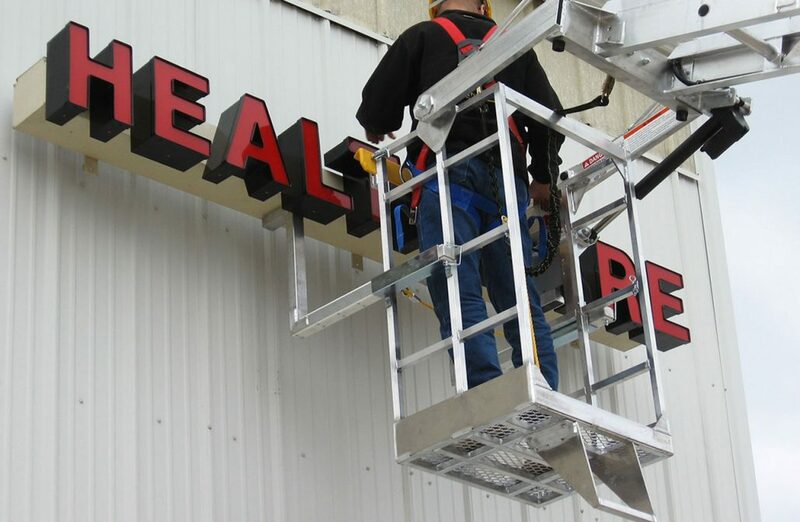 The adjustable forks allow operators to square up the sign to the mounting surface. 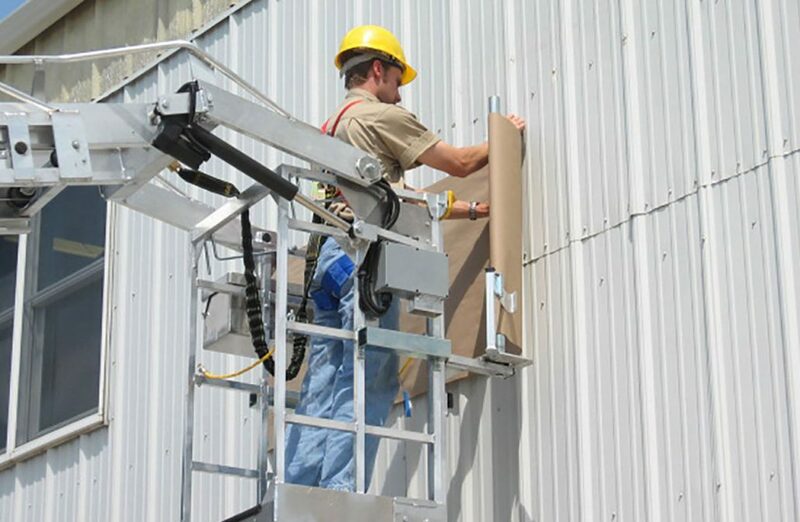 Make an easy one-man job of rolling out and hanging wall patterns or banners. 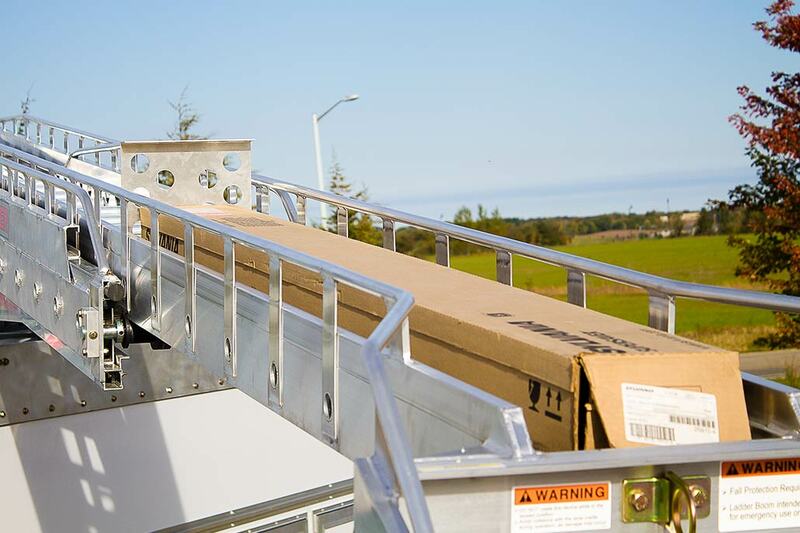 The material simply rolls off the spindle as the Van Ladder moves along the mounting surface. A spring loaded keeper ensures the spool stays tight as it unwraps. The spindle is designed to be quickly attached to the front of the bucket when needed. 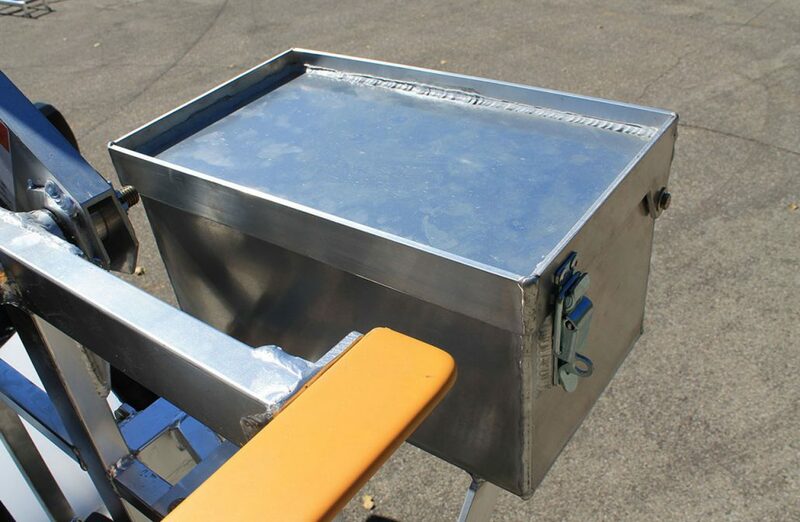 Heavy duty aluminum construction with integrated top tray. Lockable clasp to secure contents. Inside dimensions: 6 ½” deep x 8” wide x 14” long. 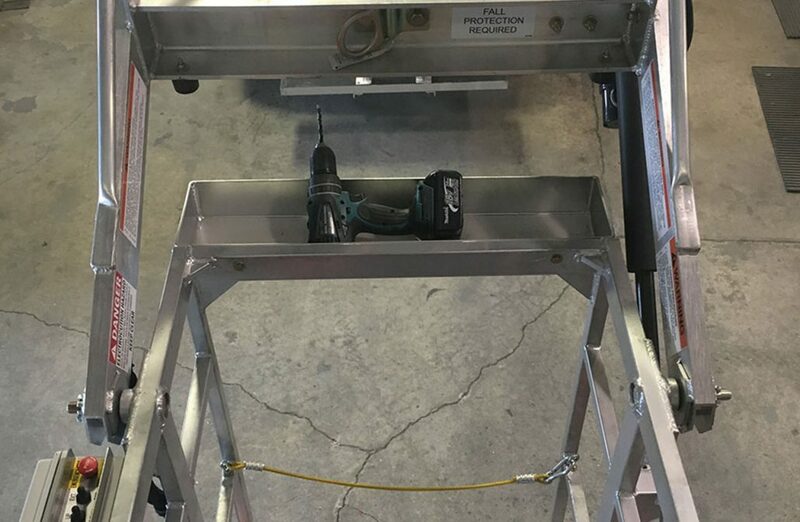 Heavy duty aluminum construction for attaching to rear of bucket. 3” deep x 6” wide x 26” long. Perfect for tools and supplies. 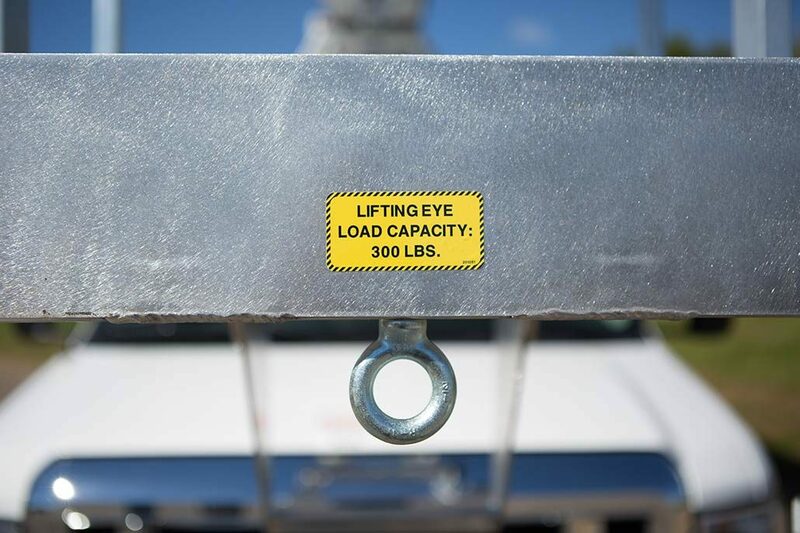 Add an attachment point rated for 300 lbs of overhead vertical lifting to the bottom of the bucket. Power up those corded tools in the bucket with the integrated 110V circuit and conveniently located outlet. 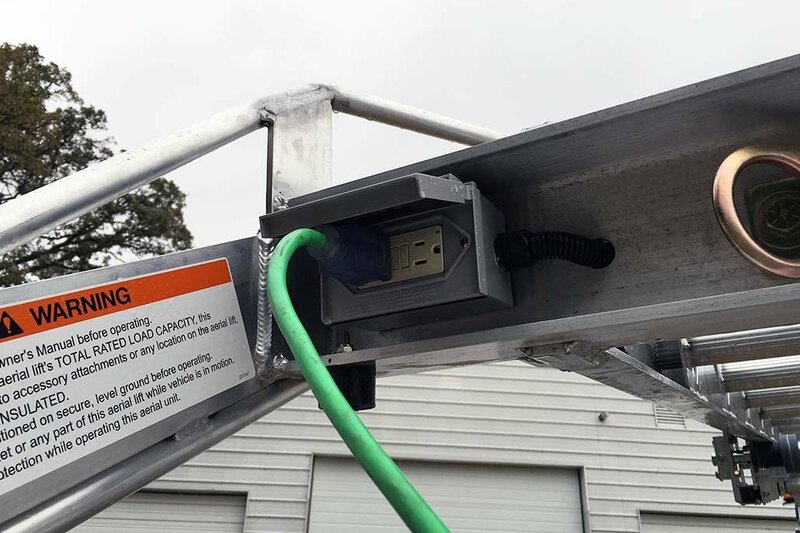 Ground level cord end provided to connection to the power source of your choice. Vehicle mounted power sources (generators/ inverters) are available and can be installed upon request. 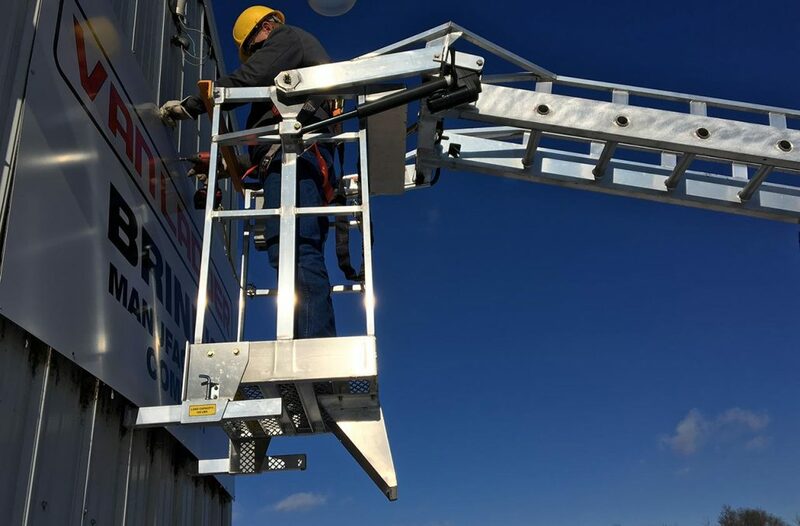 Place a box of fluorescent bulbs conveniently on the ladder boom within easy reach of the bucket. Locate the holder on any of the ladder rungs to adjust for a variety of bulb sizes. Add an attachment to carry those bulky fixtures. Customize the size to your specifications. 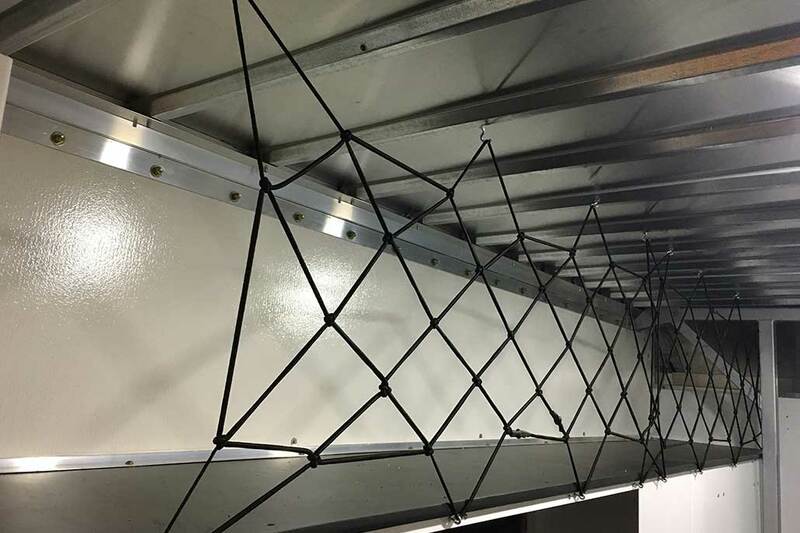 Designed for the Workport vehicle to secure bulbs or other materials quickly and conveniently. 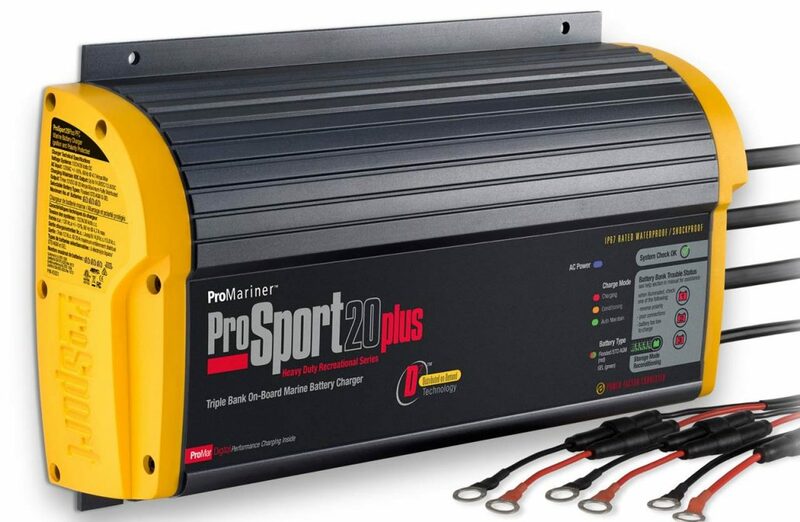 Marine grade charger to keep all batteries in optimum condition after prolonged periods without much vehicle run time. Equipped with weather proof receptacle so vehicle can be secured during charging. Class 1 Amber LED strobes, by Federal Signal, increase visibility at all times of the day. Strobes have adjustable flash patterns and are permanently installed at the rear of the boom turntable. 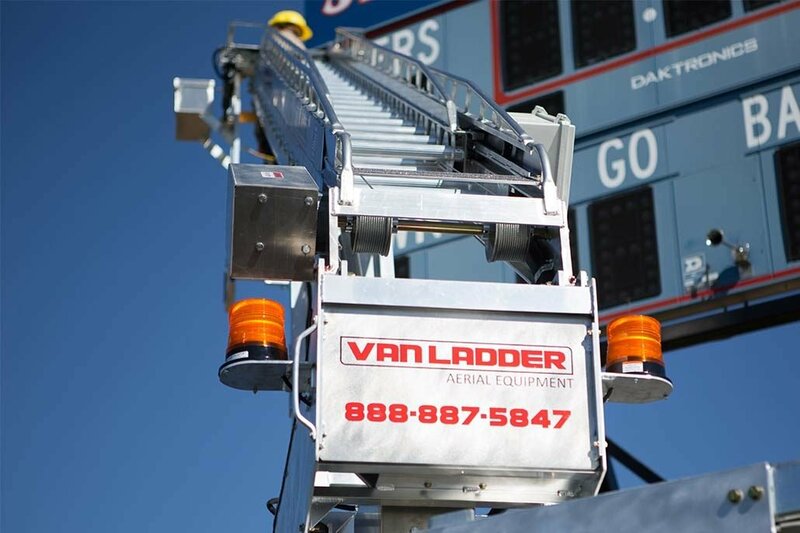 Strobes automatically activate when the Van Ladder is in use. Designed to support a full 5 gallon pail. Bucket Forks are a prerequisite for this accessory. 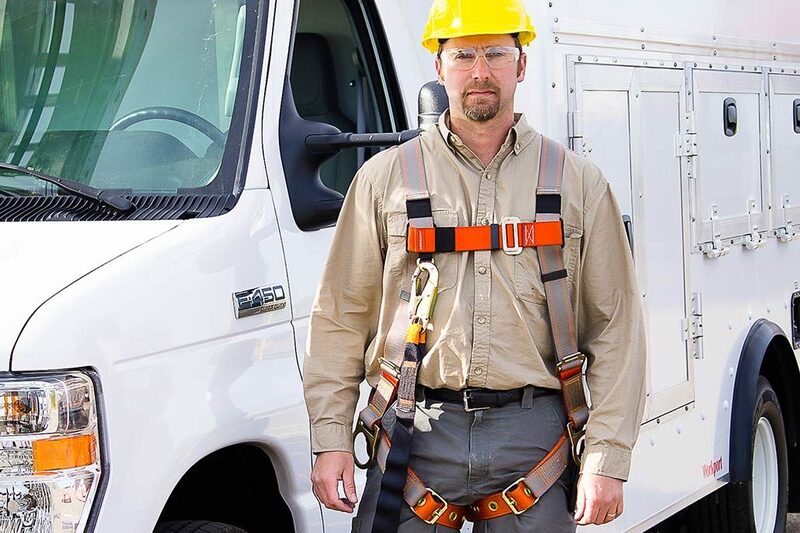 Comfortable, heavy-duty, top quality. OSHA required. 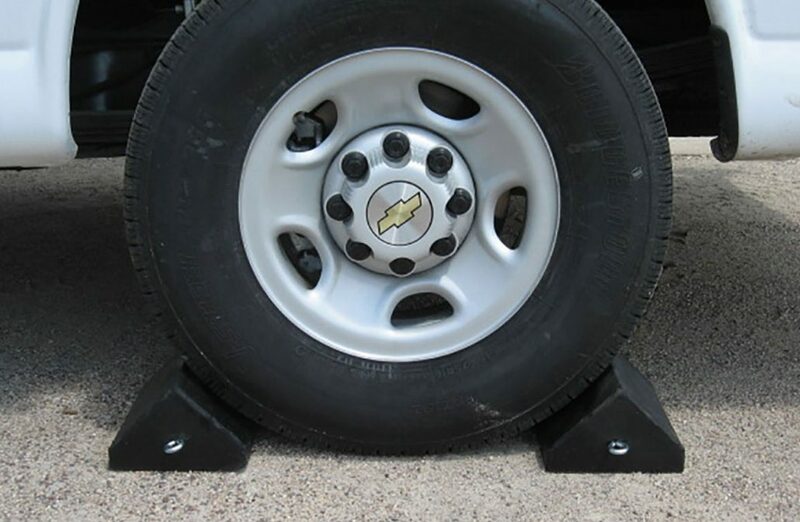 Heavy Duty molded rubber chocks to hold up to all conditions. Molded in eyelets to attached cable or chain as desired.